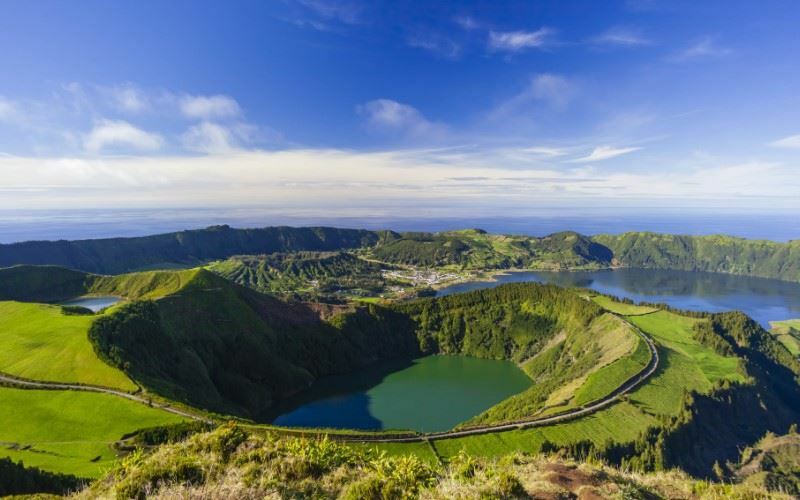 The volcanic structure of the island of São Miguel has bestowed it with overwhelming beauty; vast craters housing gleaming lakes, hot mineral springs and lush rolling valleys. Located on the eastern side of the archipelago, the island is made up of six volcanic complexes and municipalities. Our suggested itinerary takes you on a self-guided walking tour of São Miguel, using a route-book for guidance, and passing through areas of geological interest. It is also possible to extend the itinerary by 7-nights, taking in other volcanic points of interest such as the lava caves: Gruta das Torres on Pico; Furna do Enxofre on Graciosa; and Capelinhos on Faial, the site of the last volcanic eruption in the Azores. Arrive at Ponta Delgada airport and transfer to your hotel. Today you will walk to Furnas Lake (9.2km / 3 hours) where you will visit the Monitoring & Research Centre (entrance included) – a local project initiated to protect the ecosystem of the valley and improve the quality of the lake water. Afternoon transfer back to Furnas with stops at viewpoints and a tea plantation. Furnas - Lomba do Cavaleiro - This 8.4km (3½ hours) walk descends a track between green pastures until you reach a small stream. The trail then passes through a wood of Australian cheesewood, acacias and vinhática, crossing over a wooden bridge and following the stream as far as Ribeira Quente (opportunity to swim), where the trail ends. Grade 1. Furnas - Salto do Prego - This 5km (2 hours) walk takes you past woods, orchards, the Salto do Prego waterfall where it is possible to swim, a deserted watermill and the deserted village of Sanguinho, uninhabited since 1970. Grade 2. Furnas - Ribeira Funda. This 7.5km (3 hours) walk takes you to the North coast of the island. Take in the contrasting landscape passing by dense vegetation, running streams, waterfalls and wonderful sea views as you walk down towards the beach of Praia da Viola. Grade 2. At the end of the walk, transfer by taxi to your hotel in Ponta Delgada. You will visit a panoramic viewpoint en route as well as a tea plantation. Overnight at the Azoris Royal Garden Hotel, Sao Miguel. Day 7 - Ponta Delgada - Sete Cidades. Ponta Delgada - Sete Cidades. This 7.5km walk (2 hours) passes the Vista do Rei viewpoint which offers the best panoramic view over Sete Cidades and the surrounding area before heading down to the lakes. Sete Cidades is an extinct volcano crater of 40 sq.km, within which are two magnificent lakes, one deep blue colour and the other emerald green. Grade 1. Transfer to Ponta Delgada airport for your return flight to the UK. The Azoris Royal Garden Hotel is located in the capital, Ponta Delgada, just 250 metres from the town’s historic centre and cobbled shopping streets. The Azoris Royal Garden Hotel is located in the capital, Ponta Delgada, just 250 metres from the town’s historic centre and cobbled shopping streets. Within the grounds is a central Zen garden with water features and seating areas, outdoor swimming pool, tennis court, spa, wellness centre with indoor pool, gym, sauna and Jacuzzi and garden restaurant and coffee shop. The guest rooms are modern and offer options for families or larger groups in suites or executive rooms which interconnect. There is a large covered parking garage, 6 Euros per day, which makes this the convenient location if hiring a car during your stay.